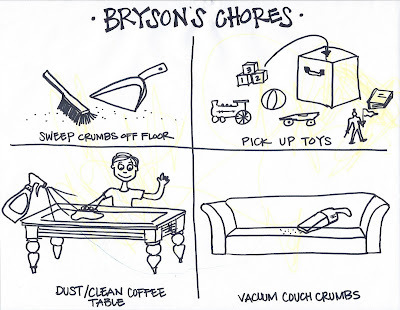 Bryson has always been a very helpful little boy, but hasn't ever had any "official" chores. So the other day I decided to make him a little chore chart and assigned him four jobs he could be responsible for each day. When I showed it to him the first time he got so excited! He sat on the couch and stared at it for about 15 minutes and excitedly pointed out each item. I was impressed he could tell my pathetic looking car was actually a car and that the little man with the flag was his toy Captain Moroni! After putting a few lines of color on it, Bryson stuck it to the fridge and I explained to him what we were going to be doing with it. As soon as I got done explaining, he immediately wanted to get to work. 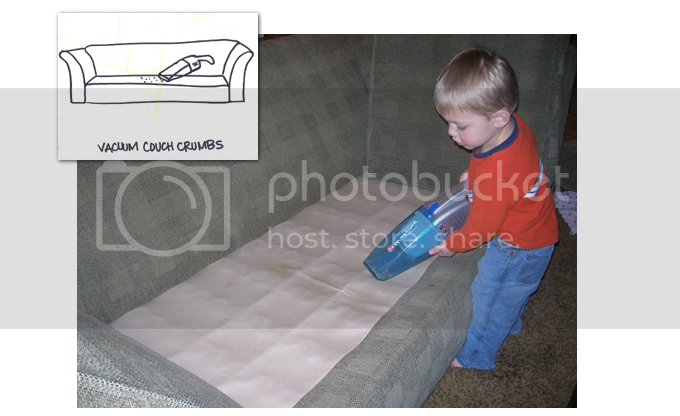 He decided to start with the couch, so he grabbed the vacuum and carefully sucked up each crumb. Then he raced back to the fridge to look at his chart again. 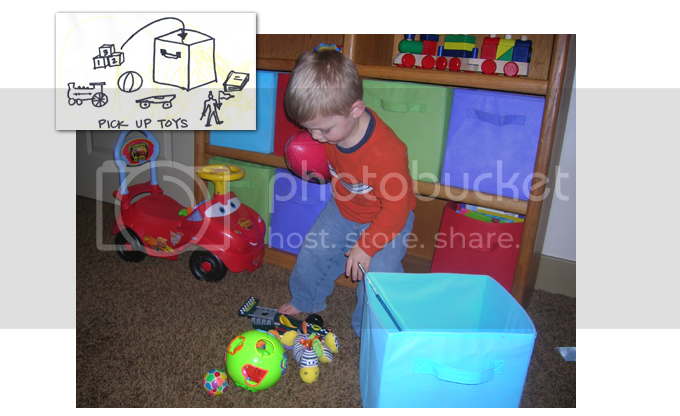 Next he decided to pick up his toys, so he ran to his room and cleaned up each toy as fast as lightning. Then ran back to the fridge to look as his chart again. 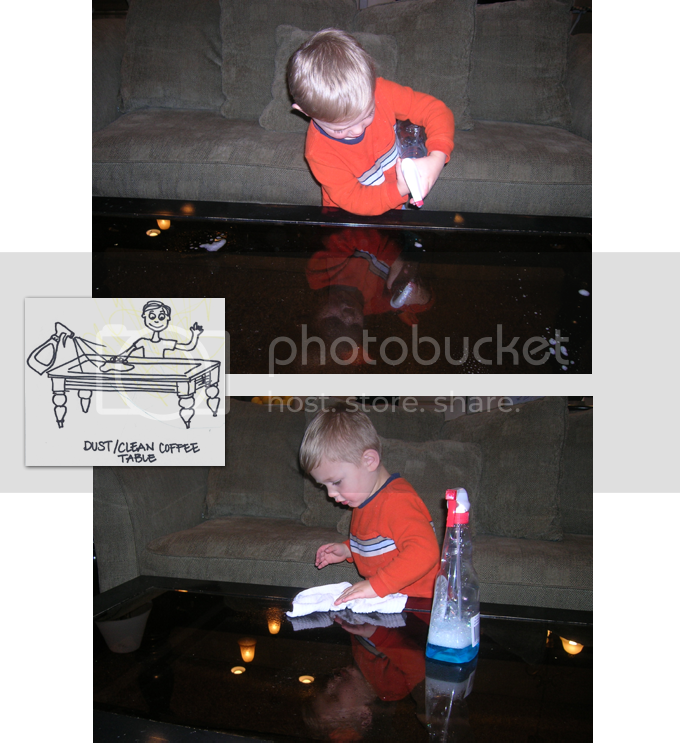 He wanted to clean the coffee table next so I helped him get out the cleaning supplies and he shined it up beautifully. After putting away the cleaning supplies, he bolted back to the fridge to look at his chart again. 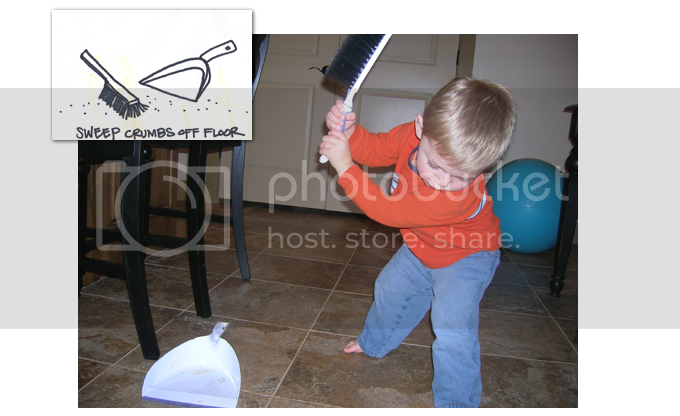 Finally, he grabbed the broom and dust pan and started whacking the floor with it. Looks like we'll need to keep working on this one. Such a good little helper! Let's hope it lasts!